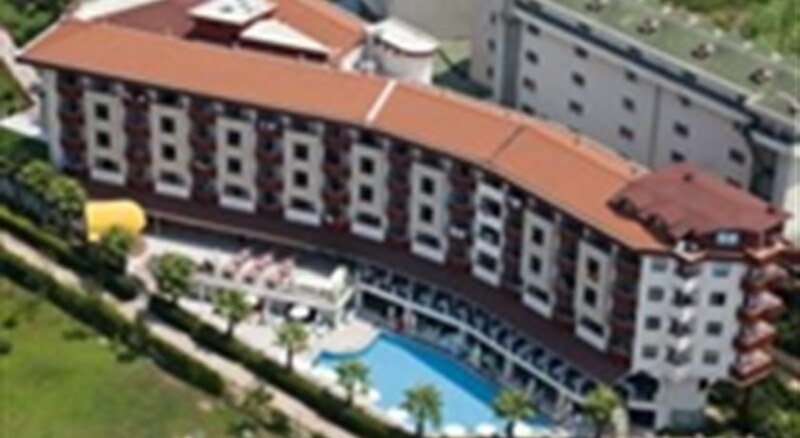 The hotel is located in the Kumkoy area- approximately 3 km from the historical resort of Side. The long- sandy beach is 350 m from the hotel. Links to the public transport network are within a stone's throw. 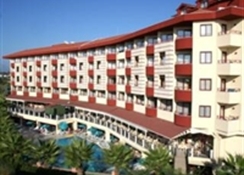 Antalya Airport is 60 km away.This modern hotel- refurbished in 2009- has an atrium with a large lobby with a comfortable TV lounge and bar area. Set in attractive gardens- the hotel's amenities include shops- a hairdresser- disco and an equipped meeting room. The establishment comprises 123 guest rooms and provides guests with 24-hour reception and check-out service- a hotel safe- currency exchange facilities- lift access- an auditorium and a dining room. Guests have access to wireless Internet and those arriving by car may leave their vehicle in the car park.The rooms are comfortably furnished and have carpeted floors and centrally controlled air conditioning and heating. Equipped either with twin or double beds- there is a minibar- safe box (both for a charge) and the en suite bathrooms have a shower. Each room additionally features a hairdryer- direct dial telephone- satellite/cable TV- radio- Internet access and a balcony or terrace.The hotel has a sauna- Turkish bath (fee payable) and indoor and outdoor swimming pools with children's swimming areas. In addition- there is a gym and water sports are available on the beach- provided by a private operator. Guests can join an aqua fit or aerobics and relax with a massage (for a fee). The hotel also has table tennis. 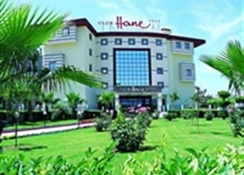 The golf course in Belek is around 40 km from the hotel. The sandy beach is nearby and sun loungers- parasols- beach towels and sun bed cushions are available for a small charge.The hotel provides board on an all-inclusive basis and meals are served in an open buffet form.